With new manager Ian McCall watching from the director's box before taking up his appointment on Monday it was up to Stuart Lovell to field the side that would play to impress their new 'gaffer' in what was a crucial game for Queens. Lovell stuck with three at the back as last week against Clyde and strung five across the middle of the park with John O'Neill and David McNiven taking on the striking role. Steve Bowey came back into the side in place of the injured Brian McLaughlin and David McNiven in place of the suspended Derek Lyle. Queens began brightly enough and in just nine minutes Paul Burns had the ball in the back of the net from a very tight angle only to be given offside. However Stranraer showed that they are a determined side with a series of six corners one after the other but with no end result despite some serious scrambling in the Queens defence. It was an evenly contested start and Queens could have opened the scoring on twenty minutes as John O'Neill had a shot blocked by the keeper on his line, the rebound coming back to O'Neill who had another effort blocked again before beating the keeper with a header but seeing the ball scooped off the line by a visiting defender. Shortly after however disaster struck as yet again a careless Willie Gibson moment cost us a goal. In his rush to start a move Gibson gave away possession of the ball straight from a free kick midway inside his own half. 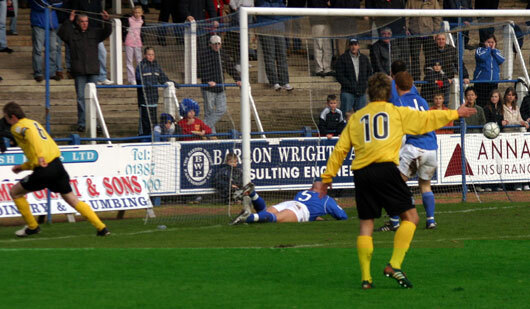 Stranraer were quick to pounce and despite efforts being saved by Scott and off the line by Carr, Jenkins finally managed to push the ball home under Carr as he valiantly attempted to save the goal for a second time. Their lead was not long lived however as the best move of the game was rewarded by a superbly worked goal. 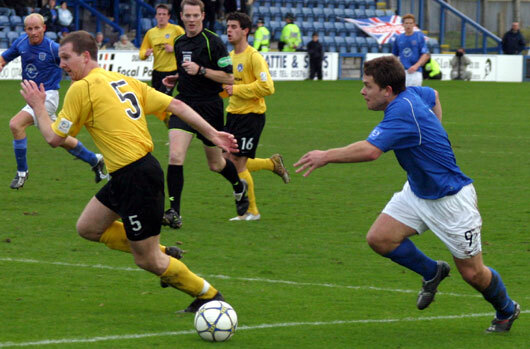 Paul Burns broke forward and fed the ball around a Stranraer defender whilst throwing the defender with a dummy. 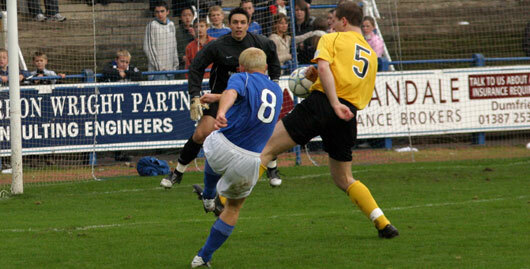 John O'Neill pounced on the ball and steered it round Corr in the visitors goal to bring the home side back level. The second half saw no changes for Queens and within six minutes Queens should really have gone ahead as a ball was laid up for Steve Bowey to volley toward goal, however he didn't direct it well enough and the ball flew well past the post. With a quarter hour of the half gone David McNiven struck what would have been a fantastic goal from well outside the box. His dipping volley had Corr beaten but it couldn't beat the cross bar as it crashed off and away for a goal kick. Colin Scott can count himself a very lucky keeper as he received only a booking for what was a clear hand ball outside his penalty area. The resulting free kick found its way into the net but the flag had gone up for offside and the strike didn't count. Eric Paton was replaced by Stephen Payne for the last ten minutes with Paton limping off the field. Ian McCall will now have a pretty clear view of what needs to be done at Palmerston as today's showing will no doubt give him some food for thought.